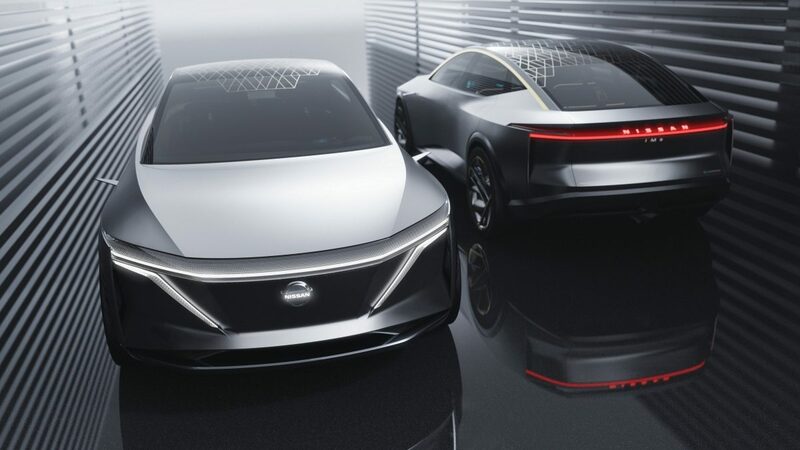 DETROIT (Jan. 22, 2019) – The Nissan IMs, unveiled at the 2019 North American International Auto Show, is a completely new type of car – an “elevated sports sedan” that takes advantage of the packaging, platform and powertrain technology developed through Nissan Intelligent Mobility. While closer to a sedan than a crossover, the IMs concept’s revolutionary proportions create a vehicle segment all of its own. It is defined by its pure electric-vehicle identity, with the battery located under the body, elevating cabin height. Its stretched interior space, a result of the vehicle’s extended wheelbase, features unique “2+1+2” seating architecture with pivoting front seats and a rear seat that either offers three-across seating, or, once the slim rear outboard seats are folded, an indulgent “Premier Seat” in the rear center, worthy of world-class executive travel. The powerful exterior and interior design of the IMs is made possible by the innovative electric and autonomous technology developed through Nissan Intelligent Mobility, the company’s vision for changing how cars are powered, driven and integrated into society. The IMs is a study in duality and contrast. In autonomous driving mode, it features completely hands-free operation, whereas in manual driving mode, it delivers the exciting, high-performance driving experience that only an advanced electric vehicle can provide. The IMs also possesses the highest levels of safety technology and virtual world connectivity – all wrapped in an alluring package that highlights modern Japanese design and craftsmanship. Fully embracing the three pillars of Nissan Intelligent Mobility – Intelligent Driving, Intelligent Power and Intelligent Integration – the IMs moves toward the creation of a sustainable mobile society centered around electric vehicles, autonomous driving and connectivity. The IMs’ electric powertrain consists of dual electric motors (front and rear) and a fast charging 115 kWh battery that generates 483 horsepower (360 kW) and 590 lb-ft (800 Nm) of torque, ensuring that the concept car will not only keep up with modern-day sports sedans but leave most of them in the dust. Capable of traveling an estimated 380 miles on a single charge, the IMs is on the same playing field with its gasoline-powered counterparts in terms of range. The powertrain utilizes a high-performance all-wheel-drive system, resulting in an ideal front/rear weight balance, exceptional traction and excellent cornering performance in nearly any conditions. Thanks to an advanced air suspension that adapts to different driving situations, the IMs provides a silky-smooth ride and flat cornering characteristics. The IMs concept’s exterior exemplifies Nissan’s new “elevated sports sedan” design language, which transforms a traditional sedan into a vehicle with provocative proportions, sporty character and excellent aerodynamics. Unique to Nissan, it seamlessly marries futuristic high-tech qualities with timeless Japanese accents. The IMs exterior form is characterized by simple horizontal and vertical lines rather than sculpted surfaces. It forgoes Nissan’s signature “floating roof” theme to take advantage of the new body proportions’ forward A-pillar and extended C-pillar locations. The sleek shape isn’t just sporty; it also results in a low drag coefficient. Additionally, various body panels, including the fenders, front spoiler, rocker panels and a full-length undertray, provide effective downforce and minimal lift at high speeds. The roofline was inspired by the shape of the moon, with the gold-colored anodized brushed aluminum roof rail accents suggesting the ring of moonlight created by an eclipse. 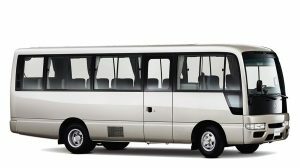 The vehicle’s unique proportions – defined by its long wheelbase and waistline, cabin-forward A-pillars and sloped rear-window angle – give the vehicle a pure, simple silhouette. Nissan’s signature V-motion design language, incorporated throughout the 2019 Nissan model lineup, is emphasized on the IMs’ grille-less front fascia through the shape and placement of the headlamps. The bold, thin V-shaped lighting design is both prominent and practical, giving the vehicle a futuristic yet distinctively Nissan look, while aggressive 22-inch wheels add to its sporty attitude. In autonomous driving mode, the IMs’ headlights and rear combination light turn blue and the lighting blinks continuously on the center of the front and rear to notify pedestrians and other drivers of its autonomous status. The exterior also features deep door sections, a three-dimensional section hood, holographic rear tail lamps, an integrated rear spoiler and a kicked-up rear bumper. The B-pillar-less 4-door body includes reverse-opening rear doors for easy interior access, a super-thin roof structure, invisible door handles with eClinch, super-flush side windows and wing cameras in place of outside rearview mirrors. The wing cameras fold in when the IMs is in autonomous mode. To emphasize the car’s Japanese character, a geometric graphic inspired from a traditional Japanese pattern called Asanoha has been applied in gold over the IMs’ smoked glass roof surface. The pattern is used throughout the vehicle, including on the wheels and inside the cabin. The interior of the IMs represents a new way of visualizing how commuters will travel in an autonomously driven world. To help express the cabin’s spaciousness, the designers created a visual separation of the body and greenhouse. Putting a priority on the vehicle’s interior space, all powertrain components have been tucked away under the cabin floor. “With the raised, flat-bottom platform and absence of interior restrictions, there’s a sense of almost levitating, as if you’re riding on a magic carpet,” said Albaisa. In contrast to the space-age character of the exterior, the IMs’ interior draws its inspiration from a modern Japanese home. 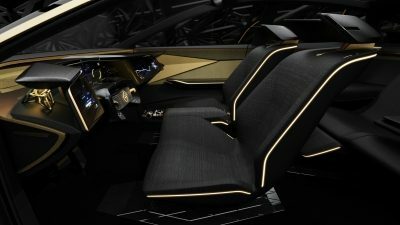 In what Nissan designers call “timeless Japanese futurism,” the cabin combines modern Japanese elements, highlighted by examples of high-level craftsmanship, with a high-tech expression. For example, the shapes of the instrument panel and door trim reflect “a spaceship to the moon,” with the use of dark fabrics and colors animated with light streaks suggesting moonlight and shadow. The colors and materials set an intimate mood that can be animated with light around the occupants. In manual driving mode, the IMs’ interior becomes a driver-centric cockpit with advanced driver-assistance technology and multi-level information displays, giving the driver full vehicle control. 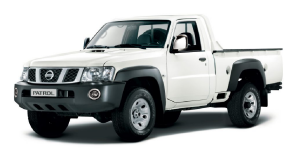 The vehicle’s complex, interconnected components, sensor outputs and control units are all integrated into a simple interface. For example, the super-thin, two-layer floating instrument-panel screen offers both technical information and a visual exploration of the world around the vehicle when desired. Completing the IMs’ sense of duality is the advanced graphic user interface. In manual driving mode, the interface is both flexible for upgrades and simple in design, including a minimal number of switches and controls. The interface’s design and logic, combined with full autonomous driving technology, allows the driver to fully experience the high level of performance provided by the IMs’ all-wheel-drive electric powertrain. The large, thin instrument panel with four compact screens follows a horizontal information architecture that enhances the interior space. The layout has been fine-tuned to follow the natural movements of the eye. Directly in front of the driver, unobstructed by the retractable steering wheel, is a “layered” instrument cluster, in which the primary layer provides only critical information to let the driver focus on operating the vehicle without unnecessary distractions. The second layer offers additional information when needed. Another key feature, the “interior sensing platform,” uses sensors and cameras to monitor the driver’s condition. It interprets facial expressions and body posture to determine if the driver is unable to continue driving. Active in both manual and autonomous drive modes, the platform will bring the IMs to a safe, controlled stop if the driver is incapacitated. Further enhancing the IMs is its unique connection to the virtual world, which Nissan calls Invisible-to-Visible, or I2V. It refers to a 3-D interface where the real world converges with the virtual world. A platform developed by Nissan, I2V helps vehicle occupants see what may otherwise be “invisible,” adding confidence and excitement to the vehicle experience. The opportunity to “see the invisible” is made possible with Omni-Sensing technology, recently announced by Nissan at the CES trade show. The IMs is connected to real-world sensing information, which is gathered and reflected from the virtual world, and displayed before the driver and passenger’s eyes for a rich mixed-reality experience. People will also be able to connect with each other through the virtual world and Omni-Sensing. For example, the technology can help drivers see the around corners, visualize precise information about traffic jams – including causes – and determine alternative routes for a stress-free journey. Drivers may even enjoy the company of a “passenger” from the virtual world in the form of a three-dimensional augmented-reality avatar inside the car. The Nissan IMs is an advanced study in progressive proportions, resulting in an entirely new type of vehicle – the elevated sports sedan. With its sleek exterior and a warm, cavernous cabin, the IMs offers a fresh kind of driving experience - manually, autonomously and virtually.